We’re all aware of the long-term damage that UV light can have on our skin, but we don’t always think about the kind of damage it can have on our eyes. If the eyewear says it has UV protection, that’s enough right? In this case, what you can’t see can hurt you. There are electromagnetic waves your eyes can detect (visible light) and our brain interprets these various wavelengths of light as different colors. If you’ve ever held a prism up against the sun, you’ll see that the prism creates a rainbow by redirecting each wavelength at a slightly different angle. Red has the longest wavelength and violet the shortest. 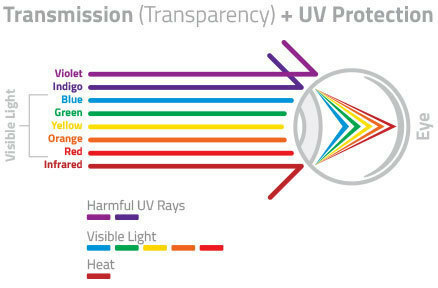 UV light is broken out into UVC (190-290nm), UVB (290-320nm and UVA (320-400nm). UVC radiation is almost completely absorbed by the earth’s atmosphere and the ozone layer, so we need to worry about UVB and UVA when it comes to blocking harmful rays with our safety eyewear. The good news is that polycarbonate, which is what most safety eyewear lenses are made of, will help to naturally filter out some of this UV light. Polycarbonate only filters up to 380nm, leaving a 20nm range unprotected. According to The Vision Council, the majority of harmful UV radiation comes through at a higher frequency, and the range of 380-400nm lets through as much as 40% of the most harmful UV rays. Not protecting yourself from the additional 20nm of UV light can lead to Photokeratitis (also known as “sunburn of the eye”) in the short term, and cataracts or macular degeneration in the long term. How Do You Protect Eyes Against UV Light? At HexArmor®, we go the extra mile to make sure your eyes are safe and protected. All HexArmor® lenses provide 100% UV protection, including clear. Being the manufacturer of not only the eyewear but also the polycarbonate lens, we are able to put an additive into the lens during the manufacturing process. 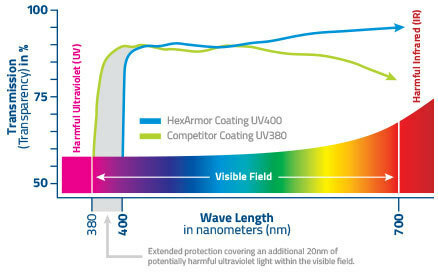 This additive will block the additional (and most dangerous) 20nm and give you 100% UV protection up to 400nm. Remember, UV light isn’t part of the visible light spectrum, so be sure to not confuse blocking UV rays with needing a shaded lens on a bright sunny day. Filtering UV rays are different than filtering from the visible light spectrum. 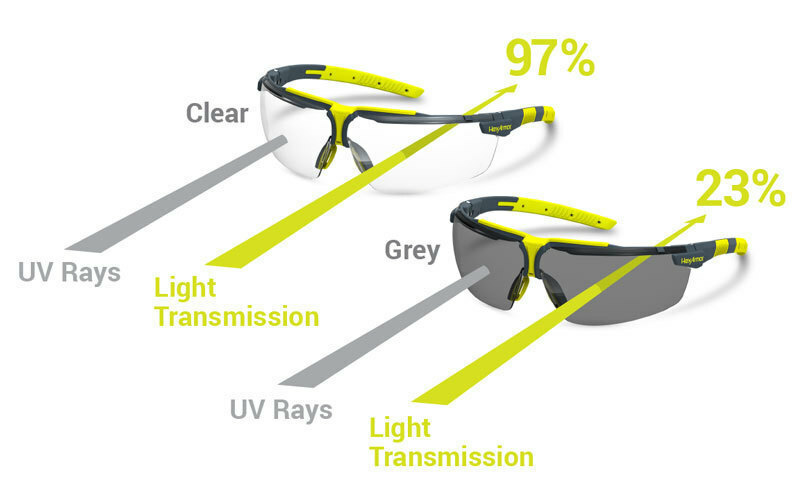 Now that you understand the importance of UV protection with your safety eyewear, make sure that you are selecting an option that offers 100% UV protection. Only having 95% or even 99% UV protection can still leave you exposed to some of the most harmful rays. Our eyes are critical to helping us perform our jobs and they are equally as important to our personal lives (12 fascinating eye facts). Do your part to protect them.